Poly-Jean® Wipes are highly absorbent wipes, manufactured of 100% polyester with a non-raveling 60 count interlock knit fabric. The absorbency for oil, water and solvents exceeds 200%. Color: White. The standard Purity Wipes are Class 10 clean room compatible wipes and are comprised of 100% continuous polyester fiber that is especially clean and highly absorbent. The knit construction has been developed to insure the greatest product integrity and cleaning performance. Laundered to reduce particle generation and soluble extracts. Absorbency exceeds 200%. Basis Weight 105g/m2. Color: white. Heavy duty Purity Wipe which is also class 10 clean room compatible, similar fiber and knot but has a higher absorbance and is more durable than the standard Purity Wipes. Basis Weight 137g/m2. Color : white. The class 10 clean room compatible and highly absorbent static dissipative Purity Wipes are comprised of continuous filament polyester fiber that includes DuPont's NEGASTAT® carbon yarn. The carbon yarn enhanced the electrical conductivity of the wipes, which promptly disperses electrical static. 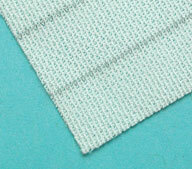 The knit construction has been developed to insure the greatest product integrity and cleaning performance. Laundered to reduce particle generation and soluble extracts. Absorbency up to 400%. Basis Weight 115g/m2. Color: white with gray stripes to designate ESD. Individually packed, lint-free cleaning wipes, saturated with 96% Isopropyl Alcohol and are safe for skin contact. Removes dust, dirt, oxides and most contaminants from instrumentation, tools and electronic equipment. Pad size is 3" x 4" in individually sealed packs. Class 100 cleanroom compatible cleaning wipes, pre-saturated with 70% Isopropyl alcohol and 30% deionized water. The fabric is constructed of continuous polypropylene fibers bonded with together with a meltblown process. This ensures superior strength with low fiber and particulate generation. The solvent ratio has been found most effective for cleaning and provides efficient drying without leaving a residue. Wipes are packed in a resealable polyethylene pouch. Perfect for general cleaning, maintenance, wipe-down, final inspection and field use. Class 100 cleanroom compatible cleaning wipes, pre-saturated with 70% Isopropyl Alcohol and 30% deionized water. The fabric is a blend of polyester and cellulose hydroentangled to provide high strength without the use of binders, starches or thermal bonding. Low particulate, nonwoven absorbent structure. The solvent ratio has been found most effective for cleaning and provides efficient drying without leaving a residue. Wipes are packed in a polyethylene container with a resealable lid. The top is designed to be opened effortlessly with the gloved hand, yet preserves the remaining product. Use to wipe, clean, or dry cuvets, delicate glassware, syringes, pipets, and pH electrodes. They are ideal for filtering and do not fall apart like paper towels. 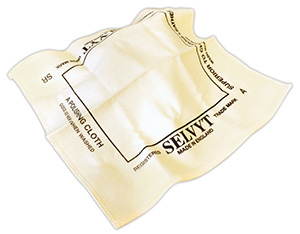 All-purpose cheesecloth wipes are brilliant white and certified 100% pure cotton of reagent-grade quality and purity. A unique combination of cleanliness, softness, absorbency and strength. Will not scratch sensitive surfaces. Wipes absorb six times their weight and absorb both solvents and aqueous solutions. Inert to even harsh solvents. Available in two sizes and packed in dispenser boxes. Lintless, soft, pure cotton, cut on a bias. For polishing sensitive EM parts and cleaning delicate parts. Can be used to clean soft and precious metals. TexWipe® wipes are 100% cotton woven from high quality, long-staple cotton fibers (no chemical additives) with tight-weave construction and a base weight of 175g/m2. 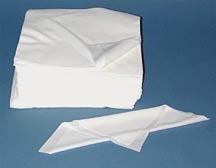 The twill patterned surface on both sides of the wipes traps and removes contaminants form the cleaned surface. Has a uniform structure, high absorbency, is solvent compatible, heat and acid resistant. 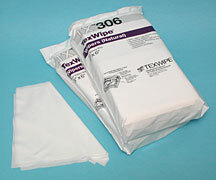 TexWipe® has inherent antistatic characteristics at 40-60% relative humidity which makes these wipes suitable for a wide range of critical applications. 45° cut to resist generation and release of fibers. Offered in 15.2 x 15.2cm (6"x6") size and packed in bags with 600 wipes. 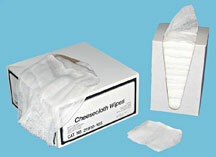 Holds one box of the Small Kimwipes®, 11.4 x 21.6cm (4.5" x 8.5") size. Center column keeps tissues pushed up to the top for easier dispensing. 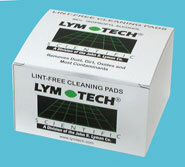 An alternative laboratory wipe, at large savings. Wipes are made from 100% recycled paper fibers. Made from natural fibers, leaving no residue on glass or other surfaces. It is a cost effective way to control contamination and provides an excellent disposable, lint-free working surface for laboratory procedures. Can also be used as a lint-free packaging material. Not static free. Sold in packs of 500 sheets. Lint-free and Scratch-free! 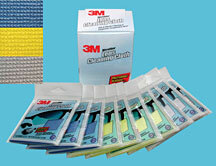 The unique 3M™ microfibers lift dust and oils from delicate lenses without the use of chemicals. 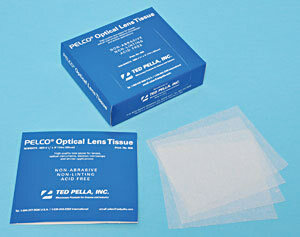 Ideal for eyeglass lenses, camera lenses, binoculars, microscopes and other delicate surfaces. The cloth is reusable and machine washable hundreds of times. Individually packaged 18 x 16cm (7" x 6") cloths, 10 to a box, two boxes (20 cloths) per case. Note: Cloths will not scratch surfaces, but can pick up particles that scratch. Each box contains multiple colors; blue, yellow and gray. Go to Sparkle Optical Lens Cleaner. Provides ultra cleaning power because of its knitted interwoven design of water- and oil-absorbing microfibers that lift and trap liquids, grease, dust and dirt particles, even without chemicals. Unprecedented dry dusting and damp polishing ability. Machine washable, dryer safe. Size: 32 x 36cm (12.6" x 14.2"). Colors: blue, yellow. The Mini Bin™ is the perfect alternative to the large, cumbersome foil rolls and expensive precut foil squares. This compact unit is an ideal fit for any laboratory bench or workstation. 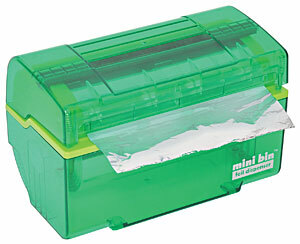 The Mini Bin™ Foil Dispenser can accommodate either the 4-inch (102mm) or the 6-inch (153mm) foil rolls (sold separately). The unique design is easy to load and safe to use by recessing the blade in the lid. Pressing the cover activates the safety blade to cut the foil. The non-slip feet offer stability and an internal foam strip keeps the foil from retracting into the unit. The versatility of the Mini Bin™ makes it a necessity for any laboratory, research environment or manufacturing facility. Designed exclusively for the Mini Bin™ Foil Dispenser. Available in two sizes; 4" or 6" width. Both rolls are 50.8 feet (15.48m). 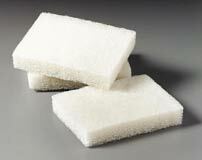 These renowned abrasive cleaning pads are made of tough non-woven open nylon web with embedded abrasive particles. 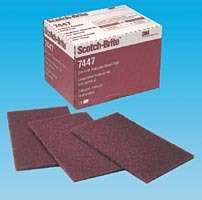 The Scotch-Brite™ pads are waterproof and they can be used wet or dry. They are designed to provide consistent performance from start to finish, leaving a uniform surface. The open web construction will not rust like steel wool and can be rinsed and used repeatedly. Size 15.2 x 22.9cm (6 x 9"). They are available in 5 grades, ranging from a medium/coarse grade for heavy duty cleaning applications to an ultra-fine grade for light cleaning applications and final surface finishing. For soft materials, such as brass and aluminum, the finer grades should be used. A convenient, thick, hand-sized pad designed for gentle, no-scratch cleaning of the most delicate surfaces. Typical applications: glass, plastic, fine china, porcelain, ceramic, non-stick surfaces and glass cookware, soft metals and glass labware. 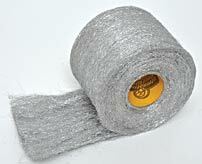 Unlike normal steel wool these rustless metal wools won’t rust or leave small fibers that cause rust. Aluminum and bronze are softer than steel and can be used for cleaning and finishing softer metals or plastics. Stainless Steel wool is corrosion resistant and can be used with water or water-based solutions. Fine grade is comparable to steel wool grades 0-00.